Where there is a will, there is a way, proves Rashmi Taniya Perera. 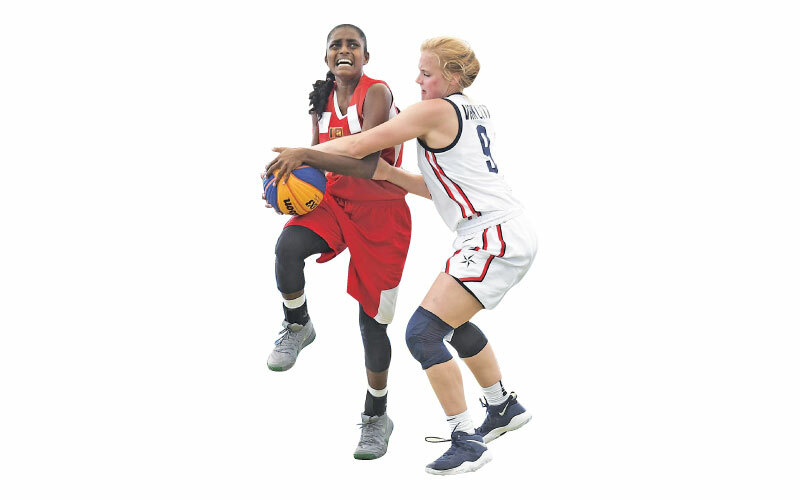 The 17-year-old student of St Joseph’s Girls’ College, Nugegoda, was ranked world #1 in the FIBA Under 18 Women 3x3 Individual World Ranking list with 131,355 points recently. She had dribbled past all odds to reach this feat after her sterling performance at the Youth Olympic Games held in Buenos Aires, Argentina. She had taken to basketball from grade three. Though she had given up the sport for a short span after witnessing the demanding nature of the game played by her seniors, she got back on track while she was in grade six. Standing tall at 5’5” Taniya says that she continued playing basketball due to her mother’s encouragement. “She saw me shooting baskets and noted that I have a knack for the sport,” Taniya explained. She took part in the Under 17 all island tournaments when she was in the Under 13 category in 2014/15, playing with and against basketball players who are much more senior than her. Her skills for the game soon earned her the opportunity to captain the under 16 national team in 2017. She had also captained her school team in the Under 15 age category. She is currently the Vice Captain of the Sat Joseph’s Under 19 team. Her first international tournament was in 2016 when she took part in the 23rd FIBA Asia U18 Championship for Women in Bangkok, Thailand. Though she scored only around two baskets in that event, it marked the beginning of a great journey. 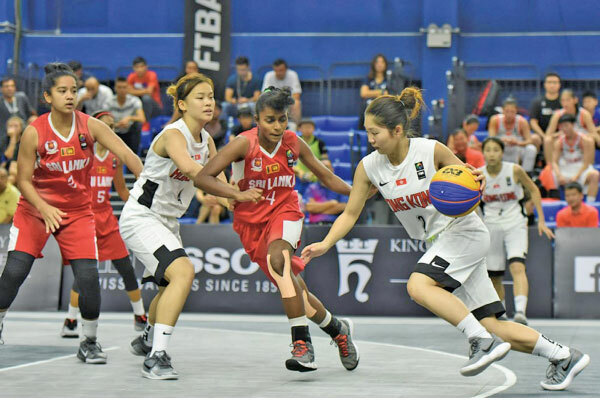 Recalling some of her best performances Taniya noted that she performed exceptionally well in the Under 23 Asian Games, the FIBA 3x3 Under 18 Asia Cup in 2017 and the Youth Olympics. She also added that she did well in the Under 19 and Under 17 National in 2016. She is in the Under 19 first year now. “I have scored around 30 to 34 in the nationals. Between 20 to 24 shots has been my highest score in an international match. I have scored around 11 or 12 shots in a 3x3 match,” Taniya said. Though she has shown talent to play any kind of shot in any position in the team, Taniya is mainly placed as a Point Guard. “The Point Guard is also known as the one. He or she is typically the team’s best ball handler and passer. They often lead their team in assists and steals. They are able to hit shots either outside the three-point line or “in the paint”. Point guards are also known as the “coach on the floor”,” Taniya elaborated adding that the one who scores is decided on the offense of the opposition team. Taniya had been trained by Ajith Kuruppu and Sivashakthi Selvaraja. Her first national coaches are Prasanna and Buddhika. She had also been trained by Shane and Anton. She says that they have advised to send as many straight passes as they possibly can so that the opponents will not be able to tap the ball. “You need attitude to excel in the game. There needs to be understanding among your team members because it is a collective effort that will win the game. Respect your coaches. Be alert. It is a tiring but rewarding game,” she said. 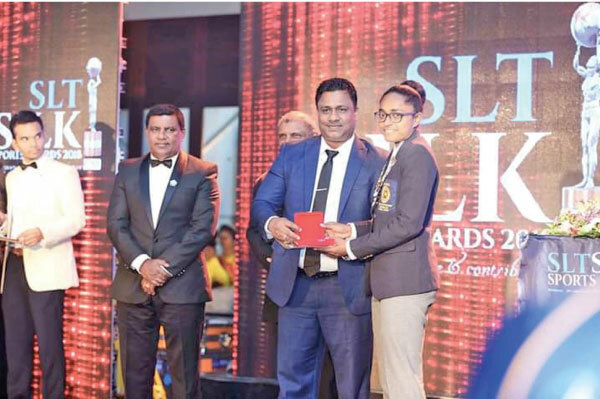 Reflecting back to some of the words of wisdom given by her coach Sivashakthi Selvaraja, Taniya said that he had asked her to give each game her 100 percent. “A game only lasts for about one and a half hours. So you need to make the most of that time while you are on the court. Keep up your confidence and you will succeed,” she said. 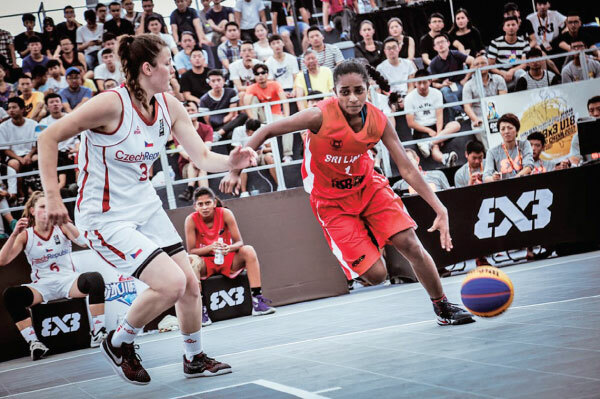 Taniya had been ranked #2 in the FIBA Under 18 Women 3x3 Individual World Ranking prior to the Youth Olympic tour. She had made it to the top of the list soon after returning back from the tour. “I had been asleep when Selva Sir called us to give the good news. Later my mother shared the news with me. She was so emotional there were tears in her eyes. I was elated,” Taniya added with a smile. She won the SLT Silk Sports Award for basketball this year. Apart from basketball Taniya is into athletics too. She is also a Senior Prefect. Her father, Kokila Nandana Perera, is working abroad while her mother, Nimesha Dilrukshi, is a housewife. 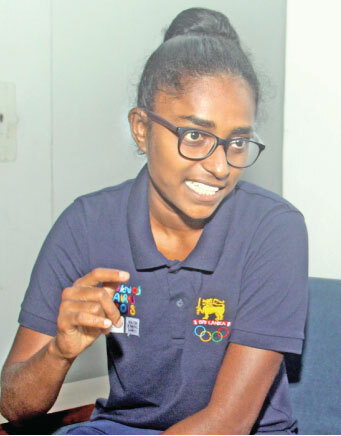 Her brother, Nipun Nishara Perera, is a champion sprinter and was the Games Captain of St John’s College in 2013. Taniya is following her G C E Advanced Levels in the Arts stream. Queried if she hopes to travel abroad for further training if the opportunity comes her way, Taniya says that it is up to her coaches to decide on which path she should choose. Her ambition is to become a judge and excel as a senior national player. “I admire Hussein Bolt and former American basketball player Kobe Bryant. However my hero has been Selva Sir from the beginning of my school days,” she said. Her words of advice to youth with diverse talents are to believe in themselves and their capabilities. “Do not back out. Believe in your talents and move forward. Your talents and determination will help you come on top of the game one day,” she advised.